I know I know this kitchen and house are long gone by now but I mean I had no time. And now I have time. So here we go.....I wanted to share with you guys a little about this kitchen because I love it so much. The reason I took on this house was because it was a lower priced home compared to my previous projects. I was really looking forward to designing something bold but on a really tight budget. The budget and space constraints got me all excited. Check out the before in all of it's stock cabinet glory. And this my friend is why I like to do my own floor plans and order my own cabinets. Had I taken this dilemma to a contractor or kitchen store, I would've 1. spent hours torturing some poor unfortunate soul asking them to tell me ALL of the versions OR 2. would've been pressured into buying the white shaker bc $$$. So, can you tell which version of the above 3 options I chose? Buying all new cabinets (Scenario 1) for this kitchen would've cost me somewhere around $2500-$3000. This is PEANUTS when talking kitchen reno. 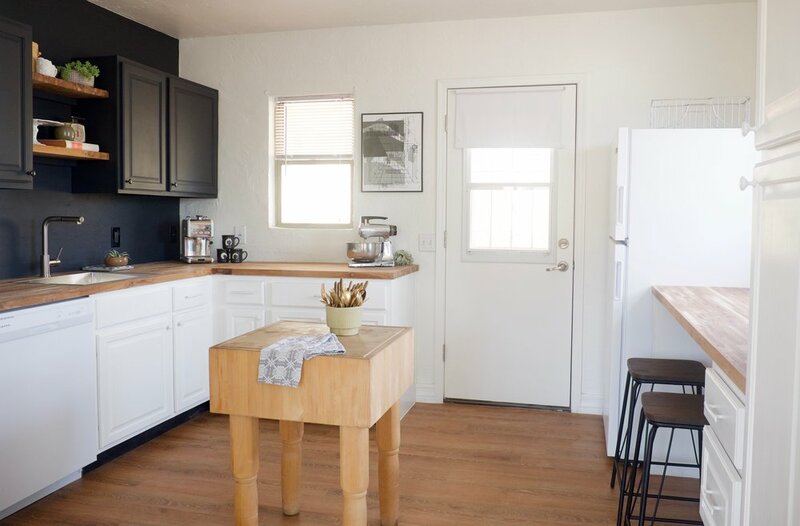 I mean seriously this kitchen is small and that is not a very large sum of money if we are talking renovating the whole damn thing with brand new cabinets. BUT, I could do better. I knew I wanted to make this kitchen bold since it was a small house and because I'm me. I love me a nice white kitchen, but I also knew I'd been there done that a million times. Don't get me wrong, I will do white kitchens again and have. I just wanted something BIG. Different. I wanted to paint the cabinets. So, I thought if I was going to just paint them, why not buy new unfinished cabinets. They are the most inexpensive cabinets alive and in-stock at Home Depot. To buy all new unfinished cabinets would cost me only $1500! Don't forget the cost to paint them, obviously. But still that would be less than all new white shakers. The final idea was to keep what was here and fill in with the "finished oak" in-stock cabinets from HD. The tricky, misleading part was that the "finished oak" cabinets were more expensive PER CABINET than the unfinished. However, once I accounted for the cabinets I already had, to fill in with the rest came to around $900. DONE DEAL. The only way this would work was if the original cabinets were in good condition and that I could work with them to form the new layout. Because of course I changed it. Here is the original floor plan. The fridge there on the left, no dishwasher and the range on the right wall. The wall opposite the sink was empty, presumably for an eat-in-kitchen space. Even though this house was small, there was a room when you walked in that was not being used as anything useful so I decided to turn it into a dining room to free up this blank wall to help this kitchen double in size. Here is the new layout. So, you can see I relocated the range to where the fridge was so it could have cabinets and counters on either side. I added a dishwasher and also moved the fridge to the opposite wall. I flanked it with a pantry cabinet for balance, as well as some other cabinets and a space for the microwave. I also added a butcher block island after the fact which is not shown on this plan. The red box represents where a counter would span over an empty space. In this area I'd have enough room for 2 stools, so there was some seating in here after all. The counter space doubled in the new arrangement. I use Magic Plan to make my floor plans. It's easy and gets the job done. In my plans I label the cabinets so the installers (and I) know what goes where and what was staying. I left out filler pieces which is why you can see gaps in some areas. I get lazy on my own projects. I do this same kind of plan for client designs. See more about client consults and eDesign here. The only cabinet that didn't make the cut from the original kitchen was the sink cabinet. To be able to fit the range and dishwasher AND sink on this wall, I had to opt for a much smaller sink cabinet. And don't you know they don't make a 24" sink base cabinet. So, I bought a regular 24" base, had my contractor take the drawer part off and affix the drawer front to the cabinet. Problem solved. The sink I bought is extra deep to make up for not having the width of a 30-36" sink. It feels huge. So, let's talk about the design itself. I know the black on top is unexpected and that is EXACTLY WHAT I WAS GOING FOR. How else was I going to make a bold statement with builder grade cabinets!? I actually thought I initially wanted to do black on bottom and white on top, but I've done that. In fact while I was designing this kitchen I got some photo updates from a client that I did exactly that design. I had forgotten. I needed to switch it up. So I did just that. Only problem was I was freaking out because I had never really seen it done. I went for it anyway thanks to some encouragement from a friend to "SHUT UP AND DO IT." Fine. I had to really commit from the very beginning. I couldn't hem and haw about it. I thought I could always repaint if I didn't like it. Only thing was that this kitchen was tiny and I didn't want stainless appliances breaking up the color palette. So, I had to choose my appliances and go for it. I chose the white appliances so all of the bottom cabinets and apps could work together to pull it off. To further this commitment, I chose coordinating cabinet hardware. I couldn't find matching white knobs and pulls I liked so I spray painted some white. TIP: When choosing hardware, think about what you want to see. It's not enough to just choose the one finish you have decided to go with in the space. For instance I could've gone with stainless, all black or even brass (the light is brass). NOPE. I didn't want to see any hardware so I made it blend. 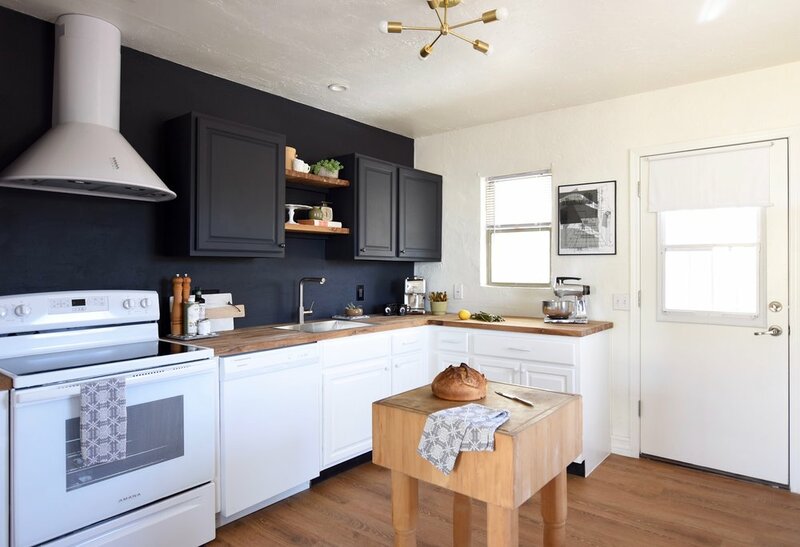 If you're designing your kitchen, and let's say you want to do black faucet and black lighting, don't think for a second you have to do black hardware on your cabinetry. Do you want to see black lines or dots all over the place? Maybe you do. But if you don't, then give yourself permission not to match. To break up all of the black and white, and to keep within a tight budget, I chose a butcher block counter and used some leftover butcher to make shelves above the sink. These were necessary. Sometimes it's not about the color (or lack there of) you are putting on the wall, it's about what you want to STAND OFF of it. I wanted that black cabinet and wall so I could have the items styled on shelves and the counter stand out. Speaking of the wall, let's discuss no backsplash. BECAUSE BUDGET. So little. But also, I wanted something different. It's not enough to just be different for different's sake, though. It also has to stand up to splashes. The cabinets had to as well. Throw another wrench in the system in the fact that I wanted it to be matte finish. Can you imagine a big ole shine coming off of that wall? So, I headed to HD and asked them which paint I should use and they told me Glidden Diamond Flat Enamel. It was meant to be scrubbable which sounded perfect for this application. Through the construction process the paint got dust all over it and needed a scrubbing. I did. It worked. No paint was removed in the scrubbing of this wall. The final piece of the puzzle were the floors. I didn't want to demo the tile throughout the entire house so I chose to try this vinyl product from HD that lays right over the top of tile! I'm so pleased without how this budget kitchen turned out. We all want to break the bank when renovating a kitchen. Sometimes it is "necessary" or even exciting to start all over from scratch. In this case, I was happy to not only be able to salvage what was there but also transform it into something bold and different AF. Below is the BEFORE AND AFTER! The process I went through with this kitchen from thinking through all of my options to finding budget friendly finishes and creating a bold design is exactly what I do every single time for my flipping and homeowner clients. Clearly the design will always be different for each house and current/future occupants, but the process is the same. I always start with a consultation where we hash out the options until we come to a final conclusion, just like I did on deciding the cabinet situation here. If you're interested in learning more about design services, click below. To shop my other designs, head to the "SHOP" section in the navigation bar and choose "SHOP THIS ROOM."